So comfortable! Love the color. Very light so easy to move. Changed the look of my kitchen and I couldn't be happier with them. Create the sophisticated dining room of your dreams with this Parsons chair set from iNSPIRE Q Artisan. The rubberwood frame is padded with over five inches of foam, and upholstered in your choice of bonded leather or linen. 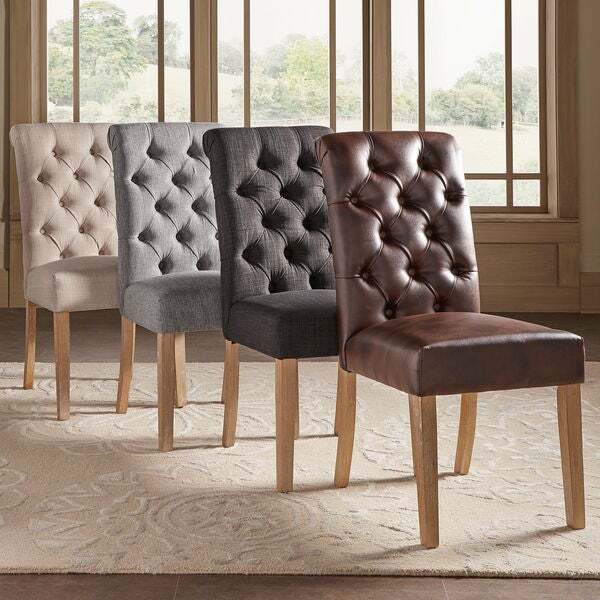 Chic button tufting highlights the high seat and rolled back. I spent forever hunting for the perfect chairs to go with my new farmhouse dining table, and I'm happy to say these are indeed the perfect ones!!! They are so graceful and gorgeous to look at, very sturdy, and super comfy, and at a great price too! The padding is plush and firm, and the leather is pretty and easy to wipe clean, so I think they'll last a long time. We use these at every single meal, and they can definitely handle heavy use. These don't have to be just pretty -- they're functional too. They came quicker than predicted, which was a nice surprise, and they were well packaged and came out of the boxes in good shape with protective wrap and all hardware needed. Building them was not a piece of cake, I won't lie -- I bought six, but I actually had to have my handymen help me with the last two of them because I had such a hard time getting the holes to line up right. Tip: when attaching the seat of the chair to the back, don't do both screws on a single side and then the other side. Instead, alternate sides as you screw, and screw loosely at first and then go back and tighten. It's tricky, but it's worth it. Be sure to really tighten everything as hard as you can so the chair doesn't wobble. And save the Allen wrench so you can occasionally tighten them again if they loosen with use. Buy these chairs! You won't regret it!!! 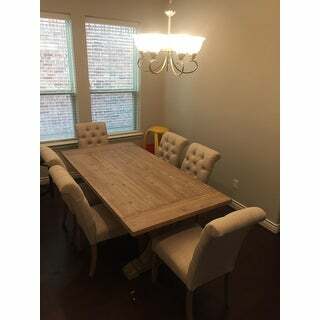 We bought the Benchwright Premium Tufted Rolled Back Parsons Chairs (Set of 2) by iNSPIRE Q Artisan chairs for the ends of our table and they look amazing! They are very well made and are super comfortable. We would highly recommend them! I waited a long time for these chairs to come back up on Overstock and when they did I jumped on them right away. 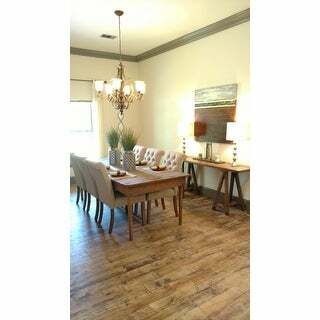 I needed ten chairs and they are a nice contrast to my rustic reclaimed barn wood table. The fabric is more beige than ivory, which is good as I have little ones. I also sprayed them with Scotchguard just in case which created no problems with the fabric. My only complaint is that they were hard to assemble-- meaning the screw holes did not match up exactly and as a result some of the chairs are a little wobbly. I fixed this with fabric "feet" stuck to the bottom of problematic legs. Still, I shouldn't have had to do this. Since I assembled ten of them and encountered the same problems with the first as I did the last, I'm sure it wasn't me but the product itself. Still, I love the chairs and they look great; I would recommend them (but know what you're up against with assembly). I bought 2 of these to see if I would like them and when they came I loved them! I was a little scared about trying to put these together based off of the reviews, but if you have someone to help you its not bad. 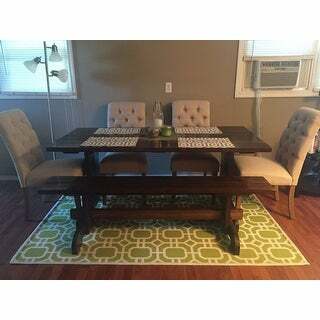 I just bought 6 more to complete my dining table. True to color (I bought the gray linen) and chairs came within 4 days. Very happy! I am happy with this purchase from beginning to end! I've had 6 of them for about 3 weeks and they arrived within 3-4 days of ordering. Unlike some customer's reviews, I had NO problem assembling the chairs. I'm a middle-aged,105 lb.woman. I read through the three steps (yes, only 3), before starting, laid out all hardware, and then proceeded. Tips: line up all the the holes on the legs and back visually and then pop in the screws. I wonder if other people had problems with lining up the holes because of humid environments. I live in Chicago area where it is cold and I assembled them right out of the box so no chance of the wood swelling (if it even does). After attaching the legs I placed the chair seat on my sofa (seat side down) and attached the back. That way the seat rested on the sofa so I didn't have to hold it and my hands were both free to pop the screws in. DO NOT tighten each screw fully with the tool until all have been inserted and loosely fastened first. I went around and tightened all screws individually about three times until all were clamped tightly and there was no "play" or creaking on any part (legs, or back). Each chair took approx. 30-40 min. Fingers did get a little sore towards the last chairs so I put on rubber gloves for extra gripping power! The fabric, light beige in my case, is very nice. it's not too thin and looks higher end. All tufts were in the right location, none offset and the assembly of the fabric to the chair frame was well done. The chair itself is sturdy, padding is plentiful, and the seating is firm, but not uncomfortably so. It may give a little over time but If not, I'll be happy with that and the chair will retain its nicely curved cushion lines. I took another reviewer's advice and Scotchguarded the entire chair as I have two kids and this is our primary seating. The fabric took the Scotchguarding with no discoloration and I had the opportunity to test it two nights ago on a teeny spot of spaghetti sauce with a damp towel. It lifted right off. Since I've had them about a month it's probably time to check the screws and make sure they are still tight. I am extremely happy with the chairs and think they were a great price and quality compared to other similar ones at retail stores in my area. If you are seriously considering them, go for it...I don't think they'll dissappoint! I bought 6 of these chairs along with 2 of the SIGNAL HILLS Evelyn Tufted Wingback Hostess Chairs in Grey. 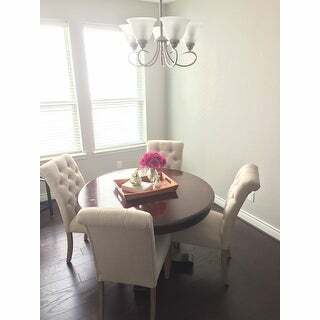 Pros: The color is consistent throughout all the chairs and is the perfect shade of grey to go with our dark wood dining table and navy walls. The chair is also very elegant looking and comfortable to sit on. Cons: Of the 3 boxes of chairs I received (6 total), 1 chair in 2 of the boxes came with an indentation within the padding on the chair seat. It was as if it wasn't properly padded. I chalked it up to compression during packaging and shipping so I let it sit out for a couple of days to see if the padding would bounce back/even out, but it never did. So I called OS and they were super helpful and sent me 1 replacement (of 2 chairs). Fedex came and picked up the two indented chairs that I put into one package. I assume OS chalked it up to shipping damage but when I received the new package a couple of days later, another chair had an indentation in it in the same spot. I was disappointed but I didn't bother to have them replace it because a) I'd rather not chance getting another chair with an indentation on it and b) I can just open up the staples at the bottom of the chair to add a little stuffing to try and smooth out the indentation. Also, the chair legs are not level like many of the reviews state, but I knew that going in and have already swapped out the pad at the bottom of one leg to even them out. All in all, those little caveats weren't large enough of a nuisance to overwhelm the style/color/comfort/price of these chairs for me. I am writing my review well over a year later and let me tell you, I'm still just as impressed with these chairs as I was day one! Not only are they beautiful to look at, but they are super comfortable and sturdy to sit on. They are holding up great and the price was unbeatable! If you are still going back and forth on whether you should buy them, go ahead and make the splurge. You won't regret it! Ps. Packaging was great and you do need to attach the legs yourself, but we didn't have any problems doing so. We bought two sets of the dark grey chairs for our kitchen table, and they were exactly what we were looking for. I love the high back on them and how much cushion is there for the bottom. Definitely recommend this purchase! Yes, a little rough to put together but so worth it. I love the leg color. Goes very well with my new lighter greyish pieces. I'm sure you could stain them dark if needed. Very comfortable. I needed to work on a few wobbly ones by tightening or loosening the bolts. I love them!! I was hesitant to purchase after some of the reviews mentioned problems with assembly and quality/defects but since they were so cute in pictures and a great deal I figured I would give it a shot considering the number of good reviews too. The first chair out of the box lived up to all the poor reviews. The holes did not line up properly when screwing the seat onto the chair back and 2 of the legs onto the seat. When it was finally all put together the chair was extremely wobbly on any surface. It was almost visibly lopsided. The second chair out of the box had a dark black permanent stain the size of a quarter on the front center of the seat back. 2 other chairs had noticeable stains but would be covered up when the chair was assembled. On another chair, the seat cushion had a large dent on the side where the foam in the cushion was obviously flawed or had been crushed. Finally the wood around most of the pre-drilled holes in all the chairs was split. 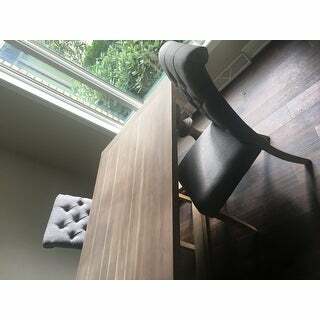 We purchased 8 chairs for our dining room and half had significant issues or defects. Some were worth dealing with because I liked the look but overall the trouble was not worth the price savings as some were completely unusable. Overstock did accept them back with no problem and made the return process very easy. I am disappointed these are such poor quality. I'm not one to typically write poor reviews but wanted to save others the trouble. We were nervous about ordering furniture online, so we only ordered two so we could check them out before buying an entire set. We are very pleased with the quality of these chairs and have now ordered the rest of our set, and a table. Not very good quality. A bit flimsy. And not very comfortable. Goes together with Benchwrist bench. Easy to clean. Sturdy. Color exactly as pictured. Easy to put together. Overall no complaints and wold buy them again. 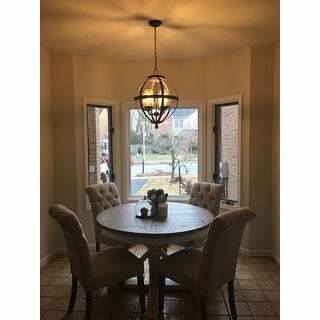 "Hi I am in the process of ordering a Wood grain farm house table "valerie" I am wondering if the beige will look good with a grey table?" "What is the weight limit on these chairs"
The weight capacity is approximately 250 pounds. "When will the dark gray linen be available for purchase?" "Greetings...when will the brown leather chairs be back in stock? From a previous question you replied December. Today is December 28th, will monitor closely. 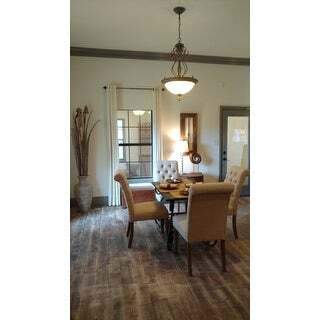 Thanks.."
"Does the grey (light) on these chairs match the light grey on the Sawyer Curved back tufted bench?" Yes, they will match. I hope it helps. "When will the light gray be restocked? I want to order these with the bench, but need to order all together." This item, in the light grey, is estimated to be back in stock in December. "When will the beige chairs be back in stock?" This is expected to be back in stock in December.